The Dunlop MSA British Touring Car Championship will blast back into action after a five-week break when the UK’s premier motor sport series visits Oulton Park in Cheshire on the 7/8 June. The Oulton weekend is notoriously one of the most popular on the calendar – indeed more than 40,000 fans descended on the picturesque venue in 2013. The intense racing and carnival atmosphere is set to move up a notch or ‘five’ this year, however, as the huge crowd will be treated to a quintet of touring car clashes on the International circuit – a layout which hasn’t been used since 1996. Not only will there be the headlining BTCC triple-showdown for the current crop of tin top talent, but the bumper bill will also feature Super Touring cars for the first time since their own halcyon days of the 1990s. So with the modern-day BTCC cars enjoying a blast in the park, the Super Touring cars of yesteryear will provide a blast from the past in what is one of the most highly anticipated events in recent racing history. Reigning champion Andrew Jordan currently leads the way after taking three wins from the opening nine races, but the Pirtek Racing driver has a number of drivers nipping at his wheels. Having won his maiden BTCC title in the season finale at Brands Hatch last year, Jordan immediately picked up from where he left off by claiming pole position and two victories in the 2014 season opener at the same venue. He has only won once in the seven races since, however, taking an impressive first ever victory at Thruxton last time out. 2012 champion Gordon Shedden arrives at Oulton in impressive form having stood on the podium in four of the last five races – twice on the top step – the first of which was the maiden success for the new Honda Civic Tourer. eBay Motors’ Colin Turkington has scored two reverse-grid victories, but will hope his BMW 125i M Sport is flying from the outset at Oulton Park. The 2009 champion took two podiums at the Cheshire track last year, which ignited an impressive winning streak at Croft in the next meeting – something Colin would be keen to repeat this time around. 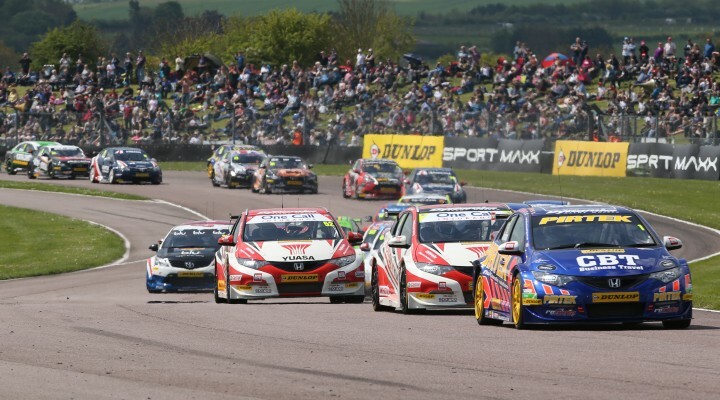 BTCC veterans Matt Neal and Jason Plato have five championships and nearly 1000 races between them, and both will be looking to get their title challenges back on track after late disappointment at Thruxton. Plato’s MG struggled for overall speed throughout the event, and although he scored valuable points in the first two races, his weekend ended prematurely after his car was hit by the Mercedes of Adam Morgan in the final encounter. Neal was always on the pace at Thruxton ­– scoring a fourth and a second place in the first two showdowns – but he too was caught up in contact in race three which forced him down the order and out of the points paying positions. As previously mentioned the Oulton Park event will also see the return of some classic touring cars from the 1990s – a much-loved era of the BTCC. A time when the world’s leading manufacturers were spending millions a season trying to win what remains today the most coveted tin top series on the planet, this financially unsustainable period eventually came to an end in 2000, but not before it had given the world some of the best loved touring cars of all time. Two Super Touring Car Championship races will be run next weekend with a phenomenal entry list of 29 cars, including a Vauxhall Vectra by none other than double BTCC champion John Cleland and a Peugeot 406 by Patrick Watts, both original drivers from the period. Those two legends won a race apiece in the series’ curtain raiser at Thruxton, but with Super Tourers appearing on the BTCC package for the first time since their own heyday, both Cleland and Watts will be looking to repeat the trick in front of a huge expectant crowd in Cheshire. As build up to the event reigning BTCC champion Andrew Jordan will be testing a 1994 Vauxhall Cavalier at the circuit on Wednesday 4th July, which will be his first time in such a machine – “I’m a Super Touring car virgin and I can’t wait to try it out,” enthused Andrew. With the BTCC currently experiencing another golden generation of racing it could be argued that the two greatest eras of the championship will be seen together for the first time next weekend. Adam Morgan scored his first ever BTCC podium when he hauled his Toyota Avensis into third place at Oulton Park last year, but the Lancastrian will be piloting an all-new machine at his home circuit in 2014. His WIX Racing squad brought Mercedes back to the BTCC for the first time in more than 25 years when it launched the new A-Class on the eve of the season, and Morgan has already proved to be a solid top ten finisher in the three-pointed star hatchback. He’ll be hoping to continue with the car’s development at Oulton with every chance of reaching the rostrum if things go his way. Northwich-based Speedworks Motorsport will be looking to build on an encouraging start to the campaign with top rookie Tom Ingram targeting a first podium at the 2.69-mile circuit. Other local protagonists include James Cole in the United Autosports Toyota and Chris Stockton in the Power Maxed Racing Chevrolet Cruze. Geographically Colin Turkington, Aron Smith and Robb Holland could also class Oulton Park as their ‘local’ race. Ulsterman Turkington and Irishman Smith will hop on a ferry to the North-West of England whilst Colorado man Holland will be as close to his USA homeland as he will be all season! In addition to the BTCC, there’ll be a plethora of races on the support bill including the aforementioned Super Touring Car Championship. The Dunlop MSA Formula Ford Championship of Great Britain – the series that launched the careers of a host of top drivers including Ayrton Senna and Jenson Button – represents single-seater racing. Sportscar racing fans will get their fix with action from the Michelin Ginetta GT4 Supercup and Ginetta Junior Championship, whilst the Renault UK Clio Cup – often seen as a stepping-stone to reaching the BTCC – will also feature on the huge bill of British racing. Tickets for the Dunlop MSA British Touring Car Championship at Oulton Park are available from £26, with free admission for children aged 12 and under. For more information call 0843 453 9000 or click here. All admission includes access to Sunday’s autograph session with the BTCC drivers in the pit lane as well as free parking.